Home > Departments > Faculty > Thomas Leonard Ph.D.
(1) With Aspergillus nidulans we are concerned with genetic regulation of the mycotoxin, sterigmatocystin. We have identified a large gene cluster that contains 23 genes associated with sterigmatocystin biosynthesis. Included in the cluster is an activator gene, anaflR, the activation of which is necessary for the activation of each of the sterigmatocystin cluster genes. We have cloned and sequenced each of the 23 genes (in collaboration with another lab). Our present short-term objectives are to determine how this large cluster of genes is regulated i.e., how does anaflR work and what regulates anaflR? 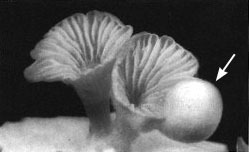 (2) With Schizophyllum commune our focus is on the genetics of uncontrolled growth. Abnormal tumor-like growths develop from vegetative and reproductive tissues as a result of a recessive gene, mound (mnd), which undergoes somatic genetic rearrangement resulting in a recombinant cell that exhibits uncontrolled cell division. These proliferating cells adhere and form a large mass of cells (see arrow in the image at right). Efforts are directed at cloning the mnd gene, comparing its nucleotide sequence with its normal allelic counterpart to discover clues as to the nature of the somatic recombination event.